Majorly fuelling the global dry shampoo market is rising interest of the working-class population for hair care products that are easy to apply due to time crunch. The need for frequent hair washes and increasing recognition of the ill-effects of regular shampoo is leading to the increasing preference for natural variants of dry shampoo among this population group. The endorsement of dry shampoo by models and hair stylists who are increasingly replacing chemical-based hair styling solutions with natural variants is leading to their growing adoption among common consumers. As per a report by Transparency Market Research (TMR), the global dry shampoo market is likely to expand at a CAGR of 6.2% for the forecast period between 2017 and 2022 in terms of revenue. If the figure holds true, the market will be valued at US$4,110.6 mn by the end of 2022 from its projected worth of US$3,043.5 mn in 2017. The report studies the global dry shampoo market based on a few parameters, viz. form type, function, demographic, distribution channel, and geography. Form type segments such as spray form and powder form could help the market cement its growth in the upcoming years. However, spray form is expected to rake in the lions’ share representing 66.6% of the market by 2022. The segment could grow at a CAGR of 6.3% between 2017 and 2022. By function, the key segments that could be crucial for the growth of the dry shampoo market include anti-dandruff, color protection, hair loss protection, and others. According to segmentation by demographic, men, women, and kids are the classification of the world dry shampoo market. Based on distribution channel, modern trade, convenience store, specialty store, drug store, online, and others have emerged as the key segments of the dry shampoo market. Geographically, the report takes stock of the potential of dry shampoo market across North America, Asia Pacific except Japan, Europe, Japan, Latin America, and the Middle East and Africa. In 2017, North America surfaced as the most lucrative regional market, serving a demand for dry shampoo that is estimated to attract a revenue of US$853.4 mn. The demand in North America dry shampoo market has been anticipated to expand at a significant CAGR of 5.8% between 2017 and 2025, by the end of which it will touch a revenue valuation of US$1,134.0 mn. However, Asia Pacific except Japan is anticipated to surpass all key regions in terms of growth rate to expand at a CAGR of 7% between 2017 and 2022. The region is anticipated to constitute a demand for dry shampoo worth US$994.6 mn by 2022 end. The Europe dry shampoo market is estimated to contribute 27.3% revenue to the global market in 2017. However, the region is expected to lose 64 basis point (BPS) in its market share between 2017 and 2022. The Middle East and Africa is expected to display an impressive growth at a CAGR of 6.5% between 2017 and 2025, to reach a valuation of US$255.6 mn by 2022 end. Japan, on the other hand, is expected to display lackluster growth to account for a mere 7.1% revenue share in the overall market by 2017 end. Prominent participants in the global dry shampoo market include The Unilever Group, The Procter and Gamble, Kao Corporation, The Estee Lauder Companies Inc., Shiseido Company Limited, Church & Dwight Co. Inc., Henkel AG & Co. KGaA, Revlon Inc., L’Oreal SA, and Coty Inc. The research report on the global dry shampoo market provides a comprehensive overview of growth trends, product innovations, and competitive hierarchy that will influence the said market over the forecast period between 2017 and 2022. It also looks into key market indicators that are anticipated to impact the growth curve over the 2017-2022 period. The overall growth perspective based on revenue generated in key regional markets sumps up the report analysis. Following this, the report covers value chain analysis and highlights factors affecting demand drivers, challenges, and opportunities in the dry shampoo market over the forecast period. The market analysis presented is based on outcomes of primary research and secondary research, and through insights received from industry experts. 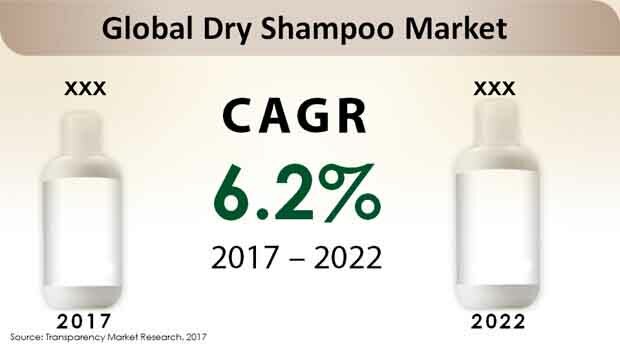 Social and economic growth indicators have also been considered for presenting market projections for the dry shampoo market between 2017 and 2022. The global dry shampoo market is gaining traction from the growing interest of working-class population for hair care products that do not require much time for application suitable for their hectic lifestyle. Dry shampoo is best suited for working-class population that requires frequent hair washes due to exposure to dirt and pollution. The changing consumer preference for natural and organic hair care products is also stoking demand for natural variants of dry shampoo. Consumers are increasingly recognizing that frequent shampooing with chemical-based shampoo leads to loss of luster and strength of hair. The report examines the global dry shampoo market depending upon form type, function, demographic, distribution channel, and region. On the basis of form type, spray form and powder form are the segments into which the dry shampoo market is divided in this report. On the basis of function, anti-dandruff, color protection, hair loss prevention, and others are the segments that divide the global dry shampoo market. By demographic, men, women, and kids are the segments of the global dry shampoo market. In terms of distribution channel, the global dry shampoo market is segmented into modern trade, convenience store, specialty store, drug store, online, and others. From a geographical perspective, North America, Asia Pacific, Europe, Asia Pacific except Japan, Latin America, the Middle East and Africa, and Japan are the key segments that divide the global dry shampoo market. North America is anticipated to lead the global dry shampoo market in 2017 vis-à-vis revenue, and the trend is anticipated to continue over the course of the forecast period. North America dry shampoo market is expected to display a significant 5.8% CAGR between 2017 and 2022. Europe dry shampoo market is estimated to hold 27.3% revenue share in the overall market in 2017. The region is expected to lose 64 basis point (BPS) in its market share by 2022. This section of the report covers detailed competitive profile of key players in the global dry shampoo market. The Unilever Group, Kao Corporation, Shiseido Company Limited, The Procter and Gamble, The Estee Lauder Companies Inc., Church & Dwight Co. Inc., Revlon Inc., Henkel AG & Co. KGaA, L’Oreal SA, and Coty Inc. are the key players in the dry shampoo market profiled in this report. This is followed by a detailed discussion on competitive strategies along with insights on business positioning, financial standing, and SWOTs of key players in the global dry shampoo market. Lastly, the report profiles the key players based on the parameters of employee strength, business overview, key competitors, and recent/key developments.